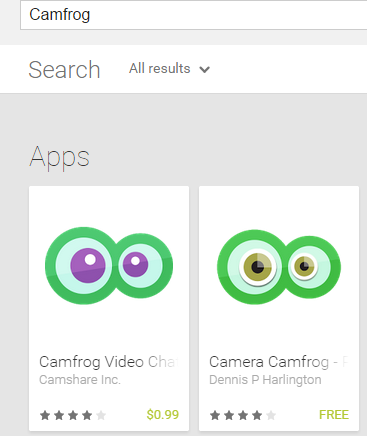 Where Did Camfrog for Android Go? That’s a sight no small business or app developer wants to wake up to, but that’s what happened with us. When we found that, we did what any business or app developer would do. We made the mistake of using Google’s Legal Removal Request forms to try to have the infringing app removed from the Google Play Store. Google’s Legal Removal Request form even included links to resources and sample takedown requests. Unfortunately those were all dead links, however the form was simple and easy to understand, so we went ahead to try to have the infringing app removed. We even made sure to add extra lines in the “infringing content URL” form fields to report the logo, as well as our trademarked name. Yes, Google had removed our own app, meanwhile leaving the fake app in the Play Store. We immediately went into panic mode, considering our app has over 10,000 downloads per day, and is a significant portion of our active users, so we did the only thing we could, and filed our first counter notice, to our own takedown request. The mighty juggernaut that is Google, will not allow our app in the Google Play Store. Due to copyright infringement. Of our own copyrights. We have filed yet another counter notice to our most recent rejection, and have been awaiting further response for several hours. 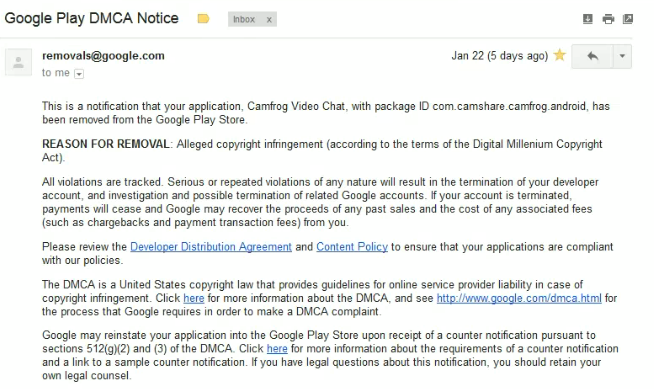 We hope that Google will do the right thing, and reinstate Camfrog Video Chat back to the Play Store immediately. ← Are You Using an Old Version of Camfrog? Im feel sorry with this.. google pay store should open their eyes .. as the profesional this thing cant happen because camshare LLC have their trade mark already i think .. the trade mark pirate is not uslees .. they just want ruined other bussines .. I bought your pro app from the play store ages ago. You need to add the locate function on your mobile app!! I hope you get the solution your wanting the app returned back too it’s home. Seems to be a reenactment of Google’s attitude when I was locked out of my Google account. Its disheartening to see that Google has built so much automation in their systems, that human intervention seems to not only be discouraged, but probably refused. In this situation, any human reader could probably be able to put 2 & 2 together, and be able to provide a straight solution. Some time its right some time its wrong .. soo use the logical before take any action … its is danger to user duplicate camfrog application on google play for free??? Seen the sales figures for Apple? Cook (Crook?) claims a good portion are people abandoning Google, perhaps because they feel scared leaving critical data in the hands of a company that can freeze access to an account, and has no store-front / humans to reach out to for service. Me, I’ve just about given up on Mobile Web services. They can become addictive, and when either Google or Apple fail (ala Maps), it can become extremely painful. The consumer is just a number, but as much as I hate to admit it, Apple does a tad bit better in getting a human on-line. Google is slowly but surely chipping away at confidence in the Play Store.